Archaeologists have found a 1,300-year-old Anglo Saxon feasting hall under the village green in Lyminge, in Kent. This is a really exciting discovery, but I have to say I'm not totally surprised that something like this has been found in Lyminge. Back in the 1990s I took part in a pagan eco-protest camp to save Lyminge Forest. There were very obvious burial mounds in parts of the forest, indicating pre-Christian pagan useage. Some of us did a meditation on top of one of these mounds. 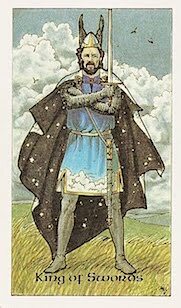 I saw a clear picture of a warrior - possibly a king - who looked to me a little like the King of Swords card in the Robin Wood tarot deck (pictured). In my mind's eye, he was armed to protect his people. There were storm clouds on the horizon indicating troubles ahead, but the warrior was ready and waiting. At the time I felt I had seen an image of someone who had lived there in the past, someone important. Maybe, just maybe, this was his feasting hall.